The rocky outcrop of Gibraltar is famous for its unique topography, its stunning views, and its strategic military value (and a pesky territorial dispute). 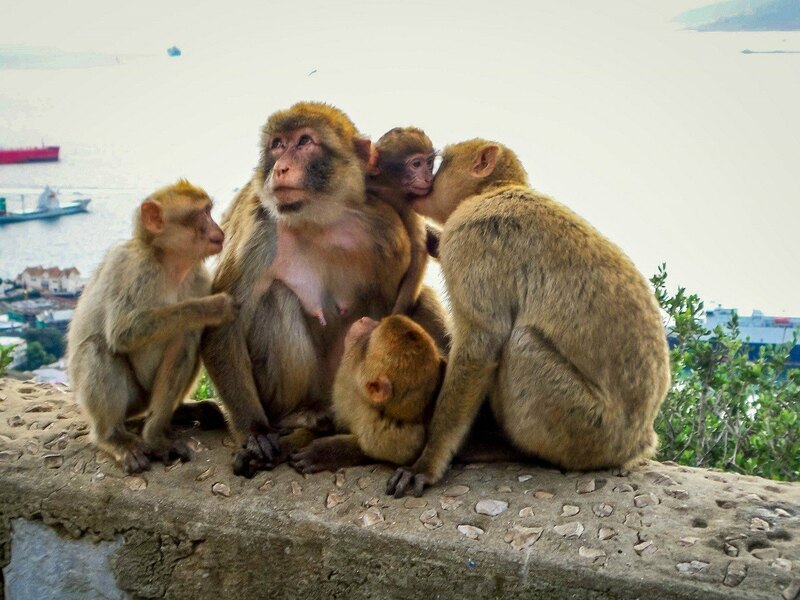 But these days, it is the Gibraltar monkeys that get all the attention on The Rock. The Rock of Gibraltar is a 426 meter high piece of limestone and one of the most iconic natural wonders in Europe. 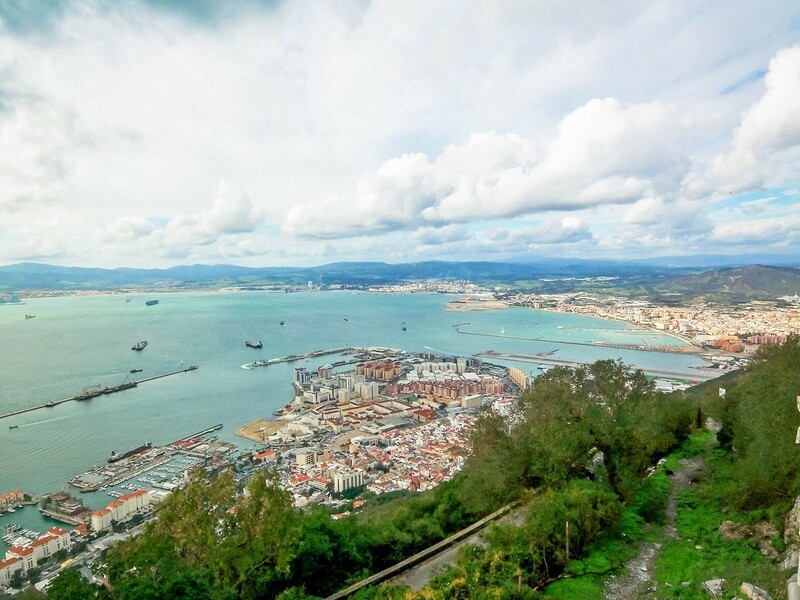 From the summit, there are stunning views of Southern Spain, the Mediterranean Sea and Morocco in North Africa. This location led to The Rock being an important military outpost between Europe and Africa. 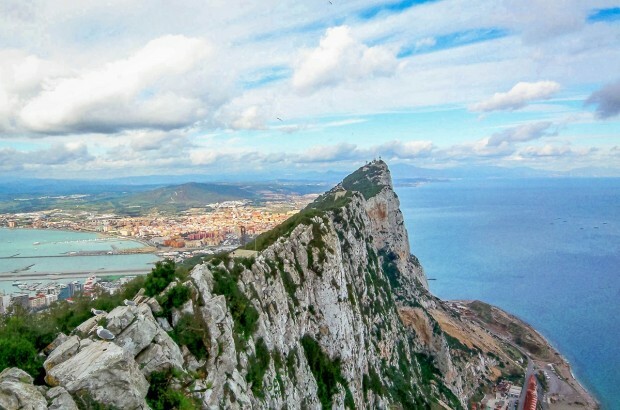 Historically, whichever nation controlled the Rock of Gibraltar controlled access to the Mediterranean Sea. 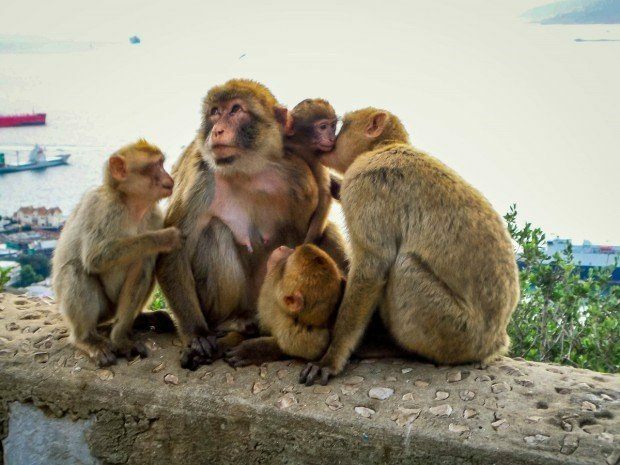 These days, the only attacks come from the resident Barbary macaques (the Gibraltar monkeys) who accost visitors for food. But more on them later. 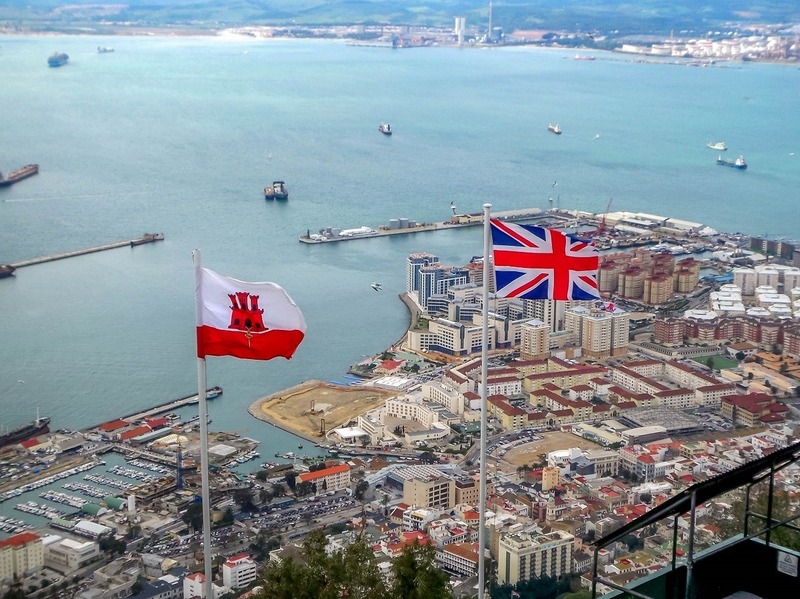 Gibraltar is attached to Spain, but is an overseas territory of the United Kingdom. The two countries have contested this little sliver of land for over 300 years. Control of Gibraltar has swung between Spain and the UK, with the UK finally winning control in 1704 through the treaty ending the War of Spanish Succession. For the visitors like us, that means Gibraltar feels a bit more like central London than Andalusia. After 300 years, Spain is still pretty upset about it and continues efforts to reclaim The Rock, although tensions seem to have eased over the last 10 years. Taking the cable car to the top of the Rock of Gibraltar, we were immediately struck by the presence of the Barbary Apes. These little guys were a contradiction – both wild and tame at the same time. 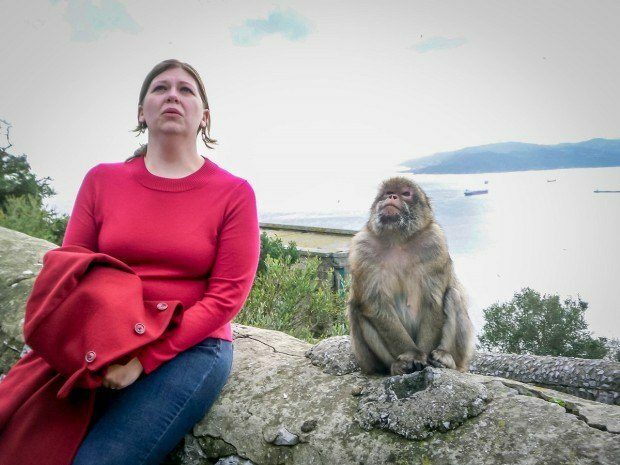 After centuries of being fed by humans, the Gibraltar monkeys definitely associate people with food. They were generally peaceful, but the presence of any food (in pockets or in backpacks) is considered fair game. 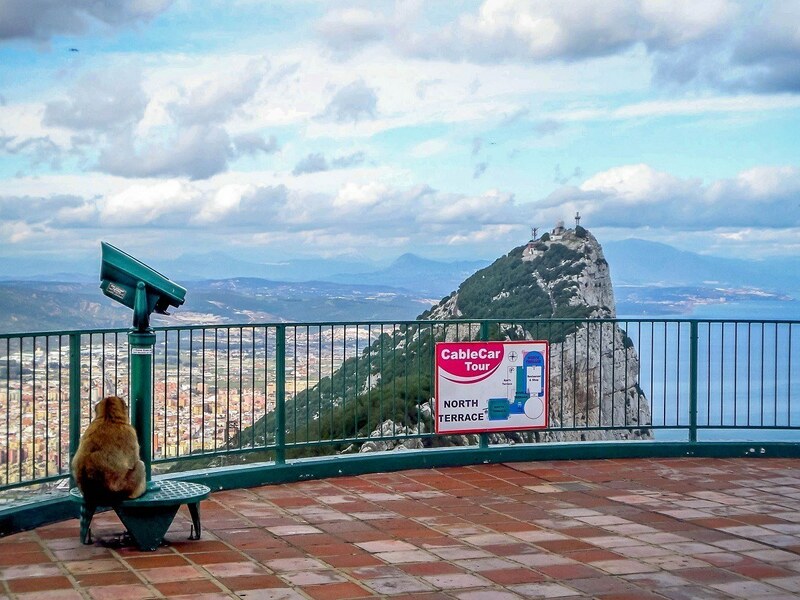 However, we couldn’t help but notice all the funny warning signs all over the top of The Rock warning visitors of various ape behaviors, including a sign instructing visitors not to mock the Gibraltar monkeys. The highlight of our day trip to Gibraltar was The Rock and watching the Gibraltar monkeys at play. And remember – don’t mock the monkey. 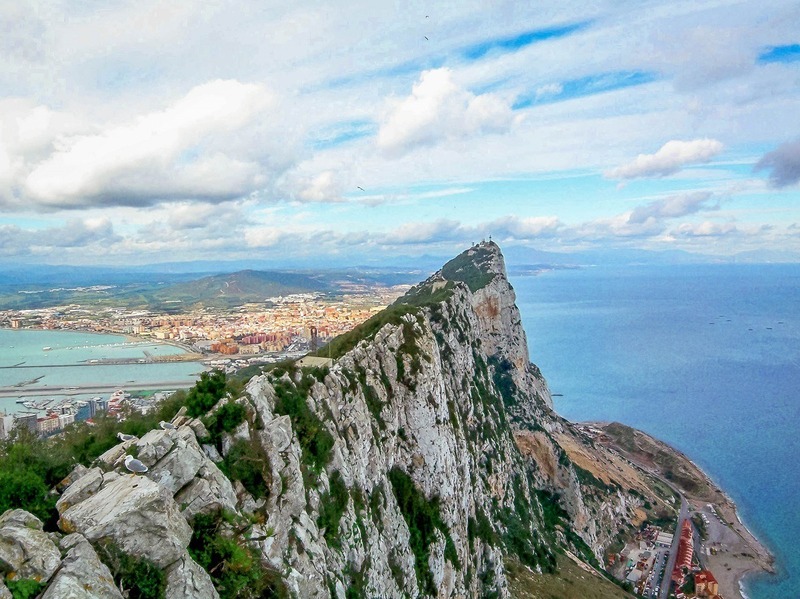 Visitors can arrive in Gibraltar via flight, boat, or coming across the border from Spain. We did the latter. Buses come throughout Spain to the little bus depot in La Linea. Our bus from Seville took four hours (definitely the local). There is a small baggage storage facility at the bus station for day trippers. The entire territory is just 2.6 square miles, so you can pretty much walk everywhere. However, for convenience, the handy bus #5 runs along the main roads (Line Wall Road and Winston Churchill) and back to the demilitarized zone, where you can walk across the border to Spain. A number of restaurants and small inns are located in the heart of the city. There are several pedestrian only streets where visitors can find a number of pubs and modern establishments. What do you think about Don’t Mock the Gibraltar Monkeys? Thanks. The only way we could stay at the Alfonso XIII was on hotel points – thank god for some work perks! Gibraltar was quirky, but I’m definitely glad we made time for it! Nice little review and like you I love the warning pictures. 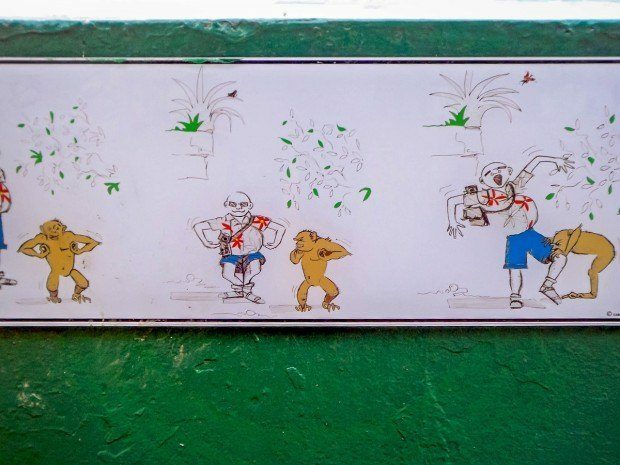 Monkeys can be pesky devils as well as entertaining. As for tensions easing, I thought that they’d flared up again in recent years. The British Government complained to Spain and the EU about the ridiculous lengthy delays at the border crossing caused by the Spanish authorities. It was ridiculous really because quite a few Spanish work on the island so need to cross the border each day. It’s been a few years since we’ve been there. I understand there have been occasional flare ups, but things are generally peaceful. The town across the border (La Linea) is…economically disadvantaged. If both Spain and Gibraltar worked on economic cooperation, they could both really benefit. I cannot believe how sweet the monkeys look… and they seem to demand respect. LoL. Ignore the warnings are your own risk!